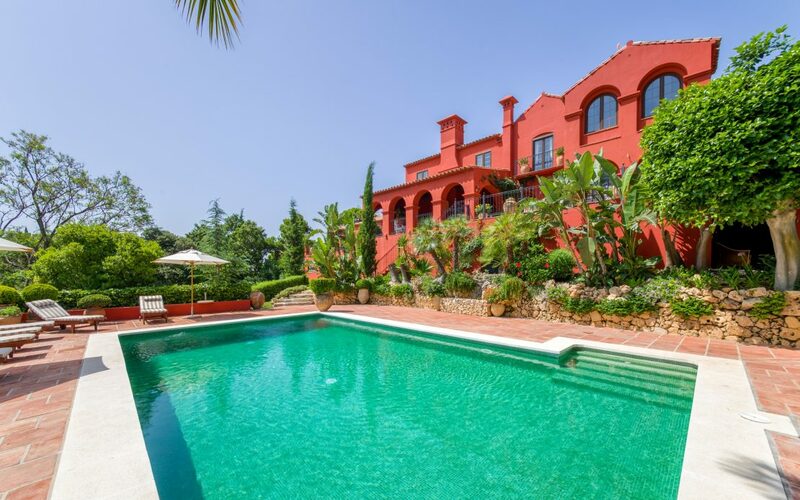 This unique villa was designed by the famous architect Cesar de Leyva and is located within the exclusive Marbella Club Golf Resort, in the heart of the Costa del Sol. Stunning views and best building quality make this villa exceptional. The beautiful driveway and walking path lead to the villa with its large entrance hall and the ample lounge with formal dining-area, a fully equipped kitchen with cooking island and breakfast area and 2 bedroom suites on the ground level. A beautiful white natural stone staircase gives access to the first floor with the master bedroom suite including his and her dressing room and the bathroom with Jacuzzi bathtub. Furthermore there is another bedroom en suite and an office on the upper level. The basement contains a separate guest/staff apartment, a bodega, storage facilities and a garage for 6 cars. The Spa is equipped with Jacuzzi, sauna and hamam, and there is a covered Argentinian barbecue area with kitchen. The infinity pool with salt water has a Geo thermal heating system, fountain features and a waterfall. Features include underfloor heating throughout, a lift, music surround system and security cameras that are connected with the TV system. Please, send me more information about ref W-012A2C, Villa in Marbella Club Golf Resort, Benahavis or similar properties.